Embarrassing really. The guy should just shut up, but like another category of Code-hater he totally lacks the ability (or perhaps just the inclination) to actually evaluate or reflect on what he's reading/saying. Words trigger him, and as James points out, his reactions totally ignore contextual indications which might usefully direct him to - meaning. 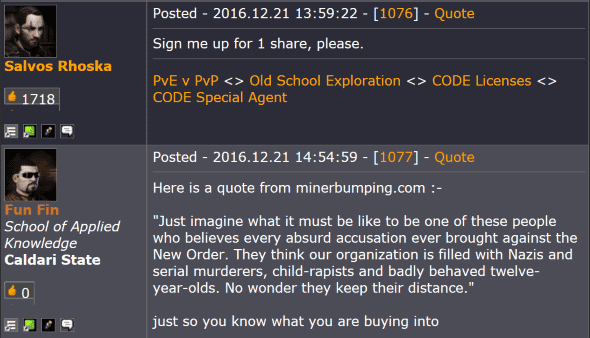 So in this case, the word 'Nazi' for example, in the text of a blog-post, linked with Fun Fin's undoubtedly baleful glare at the famous MinerBumping blue banner of authenticity, provokes the cringe-worthy outpouring we see, above. It is a trait among certain people, and I'm not sure it's altogether unrelated to laziness. Perhaps he's become so accustomed to the conventions of SMS and WhatsApp that he's lost the ability to hold anything more challenging than an emoji in that addled head of his. This is dumb. The post is dumb. The guy this post is about is dumb. Who even cares? Rob Thompson, in love with the sound of his own voice. all these highsecx PHag tears. ...as are you, Anon 8:19, apparently! There it is, the ever elusive Type 2 Code Supporter. Not Rob, he is a type 4. No, it's Anonymous 10:48. This is the BitterVet™. He comes across as very angry, and he is. He hates you, he hates this game, but at the root of it all, he hates himself for spending so much time in it at a cost of his real life. Almost as embarrassing as that one guy who got banned twice. I tried to get Fun Fin to calm down during his latest forum fit, but he just gave me an expletive in return. I fear he is beyond redemption. Your fears, Pix, are confirmed.